Upon receipt of a compressor, the nameplate data and the accessory devices attached should be recorded. As the unit is being dissembled, condition of the parts should be noted such that the cause of failure can be determined. The oil should be drained into a container to ascertain the amount and condition of the oil. After the unit is totally disassembled, all parts should be cleaned, and protected from rusting. Various methods may be used to accomplish the cleaning - alkyl and acid baths, bead blasting, hot high pressure water cleaning, etc. Whatever method is used, the unit must be thoroughly washed afterward to be certain no cleaning chemical remains on (or entrapped in) the unit or body parts. Each part should be thoroughly inspected visually and with instruments as required to determine that they are within industry tolerances and free from defects. The body itself should be inspected for scored cylinder walls, bore size, clear passages, and for cracks. Pistons should be checked for proper tolerance, worn ring grooves, and worn pin fit. Connecting rods should b checked for pin fit and crankshaft fit and straightness. Oil pumps should be tested in both directions with a bench tester or on the unit itself when reassembled. Bearings should be checked for size and alignment in the unit. The motor stator should be visually inspected after cleaning, given a megger check, a high-pot test, surge comparator check and a core test. The rotor may be given an open rotor bar test on a growler or by other means if there is reason to suspect rotor problems. Reassembly of the unit should be performed in a clean area. 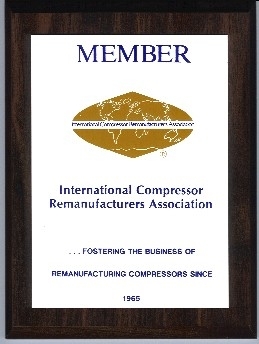 Where manufacturer reassembly specifications are not available, refer to the ICRA manual for guidance. When using unfinished bearings, the finish bore should be accomplished in an align boring machine to ensure proper shaft alignment. All bolts should be torqued to industry specifications. Compression type terminals should be replaced with new components to assure proper sealing. Upon completion of assembly the unit should be pressure tested and charged with oil. Unloaders for correct internal operation. Unit should be sealed with a positive holding charge of dry nitrogen, and painted.